The Shenandoah River, the Blue Ridge mountains–what more could you ask for! Page County is a beautiful place to have a wedding or other special events. 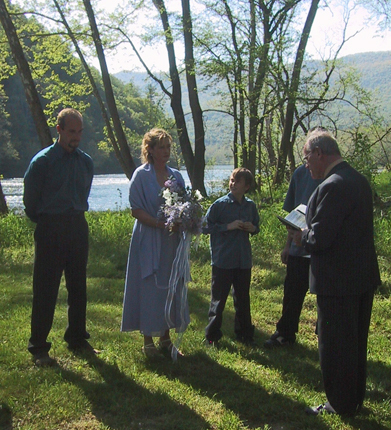 Our 3-cabin groups are perfect for the small, intimate wedding–by the Shenandoah River. We have held small weddings, business retreats and social gatherings here. The locations at Hook, Line and Sinker cabins and Angler, Drifter and Paddler cabins are ideal for small groups of no more than 18. Khimaira Farm, Stover Hall, Shenandoah Woods, River’s Bend Guest Ranch, Faith Brooke Barn and Vineyard and old favorites– Luray Caverns, Skyland Lodge, Mimslyn Inn. Luray Page County Chamber of Commerce has a dedicated website to aid the planning of the Special Day or Event–Love in Luray-Page– for information on venues, florists, catering and more.